I DO NOT Use Cheap Roofing Copper that Contains Lead. See if You can Find Another Builder of. Is Perfect for Beginners or for. Use as a Spirit Still. 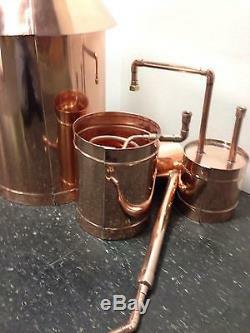 Built Using the Thickest Copper for this Type of Still. My Moonshine Stills are Built to Last. Other Sellers Have Tried to. But They Don't Even Come Close. How can I Offer Such a. 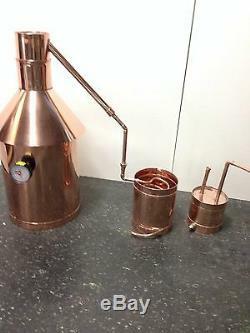 Well Built Heavy Copper Moonshine Still. At Such An Unbelievably Competitive Price? Copper in Bulk Directly from the. Passing on the Savings to You! Copper for the Price of 16 oz. Other sellers will tell you 16 oz. 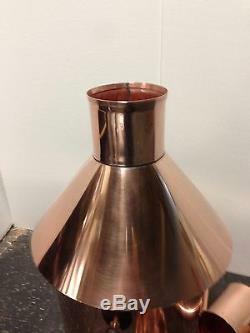 Copper is fine for stills. No One Builds Stills like. Is Built to Hold the Weight of Your Mash. 10 Gallons of Mash Weighs in at Around 100 Pounds and this. Built Using Heavy 20 oz. 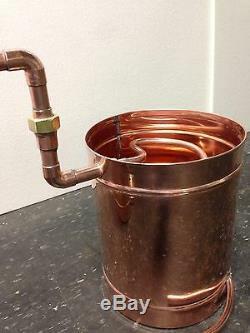 Copper is Constructed to Hold it. Is the Best Built Still you will Find. 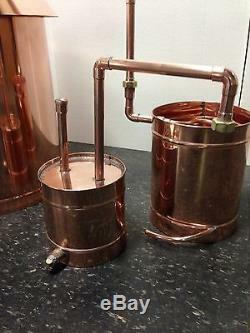 Out Perform any Copper Moonshine Still. And if You're Serious About this Hobby This is the Still you Want. 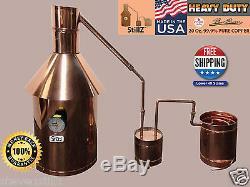 I also offer 25, 30, 50 and 60 gallon Moonshine Stills and. Custom Built Micro Distilleries up to 500 Gallons. For Prices and I will set up a listing for you. 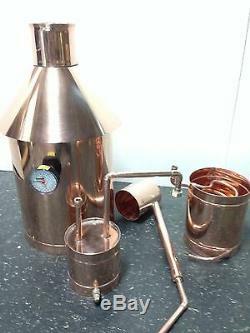 Copper Still with Thumper and Worm. 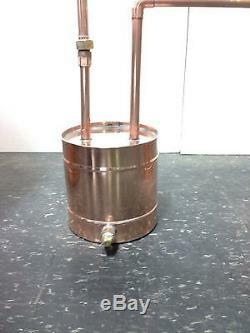 Ample 10 Gallon Copper Moonshine Still Pot 1 gallon Thumper 45 Degree cap with 1" reduced to 1/2" Copper tube to thumper 1/2" Copper Tube with copper to copper unions 3/8" 1.5 Gallon Worm with hose connections. Yes we supply them too, Do they? All Silver Solder With Pasco Professional Temperature Gauge " A Great Conversation Piece" Hand made, polished and fully tested. The pot, thumper and worm are all machine rolled , hemmed and beaded. 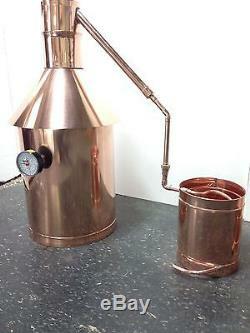 We don't just solder the bottom onto the still like other builders. The bottom is set in place inside the pot soldered to the hem shelf. Fill it with your mash and seal the cap using Teflon plumbers tape of black electrical tape for a clean seal and your'e ready to go! 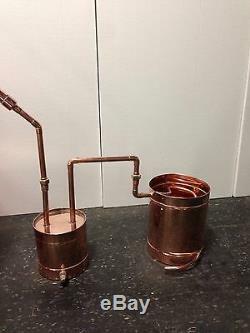 This Moonshine Still is Not "Slapped Together" There Was a Lot of Time and Skill Used in the Construction of this. This still does not need to be used in a straight configuration. Use With or Without Thumper. The thumper is attached to the pot and worm using copper to copper Unions allowing you the option of moving the pot and worm closer or further apart depending on your needs. Notice the Drain Plug on the Thumper... 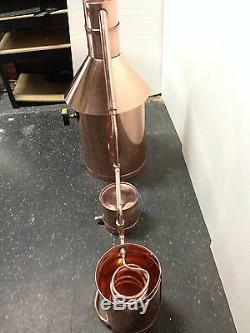 This Copper Moonshine Still will Produce a Finished Product at 57 Degrees (Very Important) Using only Cool Tap Water in the Worm. Made with Heavy 20 oz. , B rass Fittings, all Silver Solder and Water Soluble Flux. A Great Addition to Your "Mantown" Collection or Fire it Up. There are Many Uses for this Still and You Probably Know. Most are Regulated by the Federal and Local Officials. 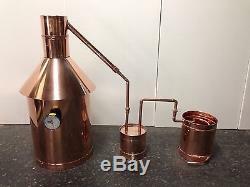 The item "10 Gal Copper Moonshine Still+Thumper+Worm 100% Guarantee Complete Setup" is in sale since Tuesday, August 22, 2017. This item is in the category "Home & Garden\Food & Beverages\Beer & Wine Making". The seller is "stevenstillz" and is located in Nashua, New Hampshire.